My wife and I decided that we were not mailing Christmas cards this year. In the past we mailed cards featuring a photo of our children or the whole family in front of the Christmas tree. We realized that almost everyone we normally send Christmas cards already sees photos of our family throughout the year on Facebook. Plus, the cost and preparation time pushed us to not to send them out. 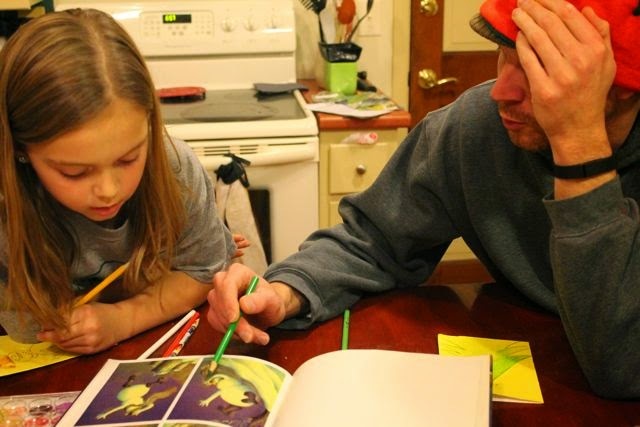 Well...these were our thoughts before we decided to read picture books by Raúl Colón. 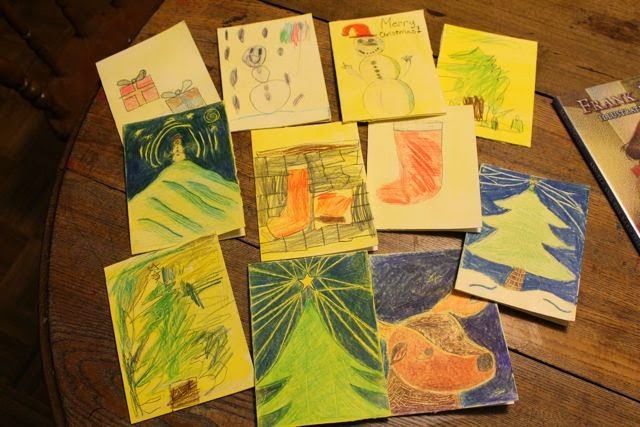 His books and artwork inspired our family to make Christmas cards that we can't wait to give to some special people. Raúl Colón is the illustrator of over 30 books for children including As Good as Anybody by Richard Michelson and A Weave of Words by Robert D. San Souci. As a child growing up in New York City, Raúl Colón struggled with chronic asthma which caused him to miss lots of school. While he was sick at home he "filled up dozens of composition notebooks with all kinds of drawings." (NCCIL). His mother thought it would be better for him to live in a warmer climate so his family moved to Puerto Rico. Upon his arrival in Puerto Rico, Raúl drew more and more and later in high school he was lucky to take a special course in commercial art for three years. (Colorin Colorado). Upon moving back to the United States, he obtained a job as a graphic artist for an educational television station for a Florida school district. After working at the television station for almost ten years he decided to become a freelance illustrator in New York. His artwork appeared in the New York Times, Time, The New Yorker, and The Wall Street Journal. (HarperCollins). His work for the New York Times Book Review gave him great exposure and led to his first book Always My Dad by Sharon Dennis Wyeth which won a Gold Medal from Society of Illustrators for one of its illustrations. (Colorin Colorado). He followed up his first book with My Mama Had a Dancing Heart by Libba Moore Gray which was named one of the Best Illustrated Books of the Year by the New York Times. (NY Times). In 2006, he was awarded the Pura Belpré Award for Illustration for Doña Flor: A Tall Tale about a Giant Woman with a Great Big Heart. In 2008, he was awarded the Pura Belpré Honor Award for illustration for My Name is Gabito: The Life of Gabriel García Márquez by Monica Brown. His latest book is DRAW! was released September 2014. I had a chance to meet Raúl Colón in Washington D.C. over Labor Day weekend 2014 at the National Book Festival (Click here to see his presentation. It is fantastic!!). 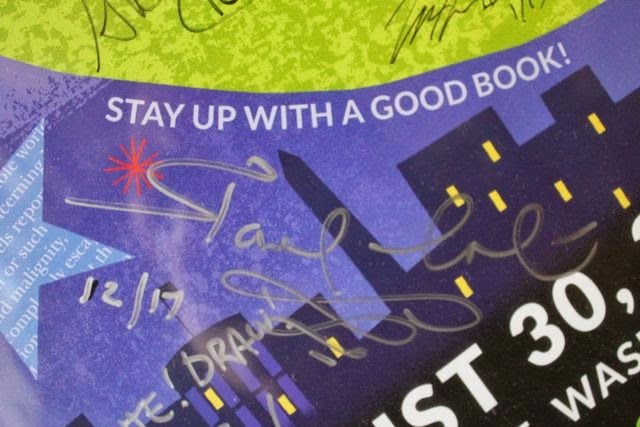 He signed our copy of Always My Dad and our National Book Festival poster. I was so happy that he shared his birthday with us. Before this week, we had only read one of Raúl Colón's books, so I ordered all the books I could find from two local libraries. While I waited for them to come in I began my research for this post and I learned about Raúl Colón's unique illustration style. This video describes his technique of using colored pencils on top of layered watercolors along with a "scratcher" to give the artwork texture. 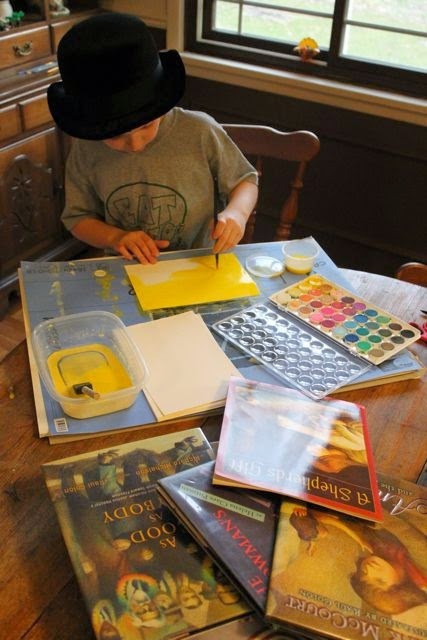 I was intrigued by his process and I thought it might be something my children would want to try. As we read each book my children were quick to point out where Raúl Colón used his "scratcher". I decided that since they were excited to point out the "scratches" in the illustrations that I definitely needed to try it with them. But, I wasn't sure exactly what were were going to make until I was talking with my local librarian about this upcoming post. I told her my children loved Raúl Colón's Christmas books, Angela and the Baby Jesus and A Shepherd's Gift along with The Snowman's Path. It was then a light bulb went off in my head. We could use his art technique to make Christmas cards. 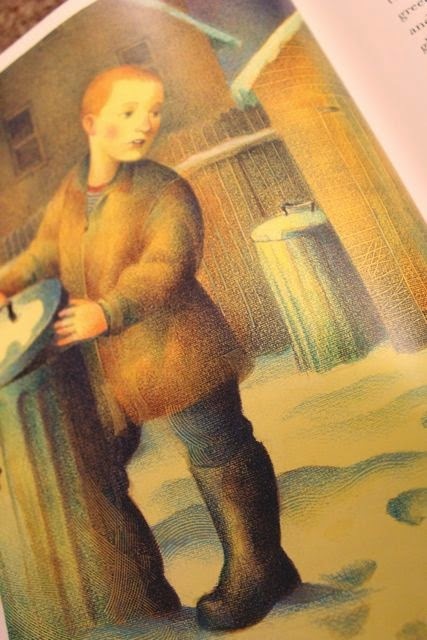 The "scratcher" was used in the snow and on the pants of the boy for this illustration from The Snowman's Path. My youngest son noticed the fence in the background too. Raúl Colón often applies a yellow watercolor wash to watercolor paper before he begins his illustration. My youngest daughter applied a wash using acrylic paint and water. 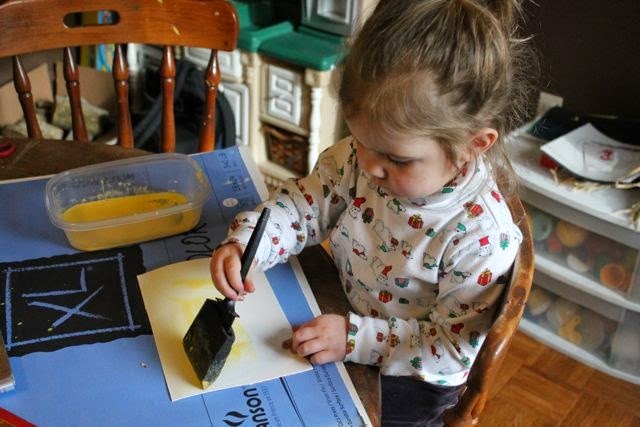 My oldest daughter used a darker, more golden yellow watercolor. 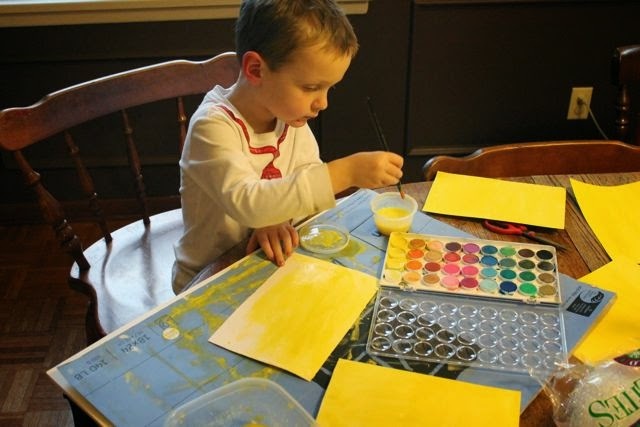 My youngest son applied other shades of yellow available in our watercolor set. 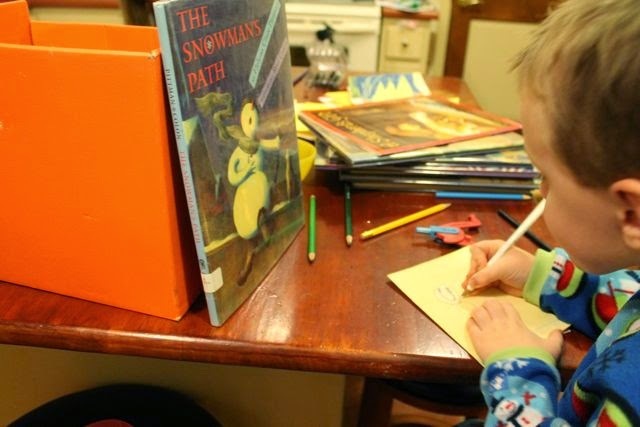 My daughter sketched a snowman on her card and then consulted the illustrations in The Snowman's Path for ideas for her scratching. 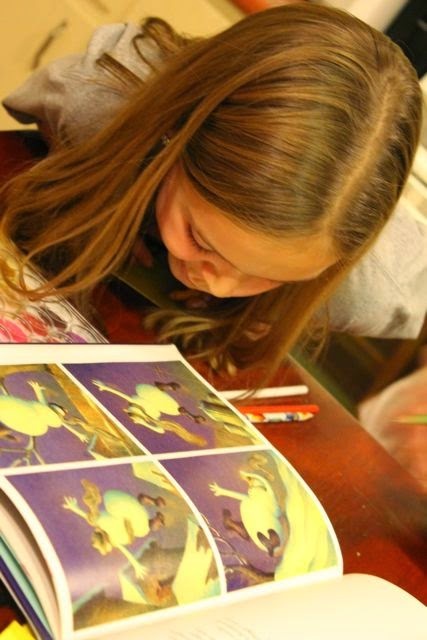 We didn't have a scratching tool like Raúl Colón (click here to see a photo), but we used a empty pen which he sometimes uses for his illustrations. (Colorin Colorado). My daughter and I talked about the blues that were used for the shading the snowman. My daughter's snowman card turned out great. I made a Christmas tree one. 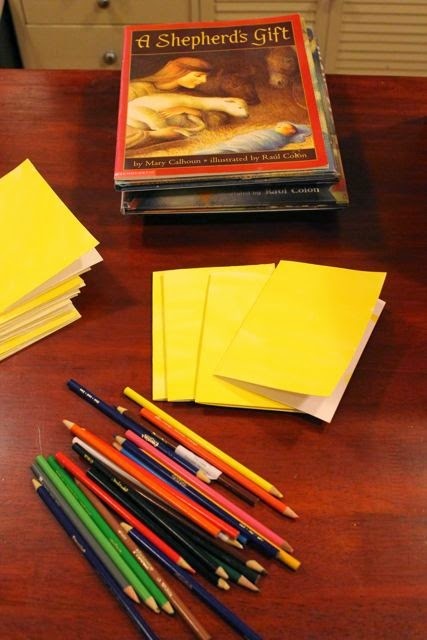 We chose to not use additional watercolors, so all our color (other than yellow) was made with colored pencils. 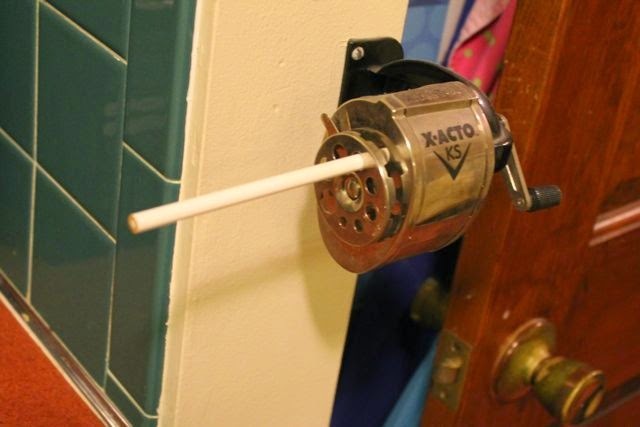 We have a pencil sharpener in our kitchen. It really came in handy for this activity. My youngest son wanted to make a card too. 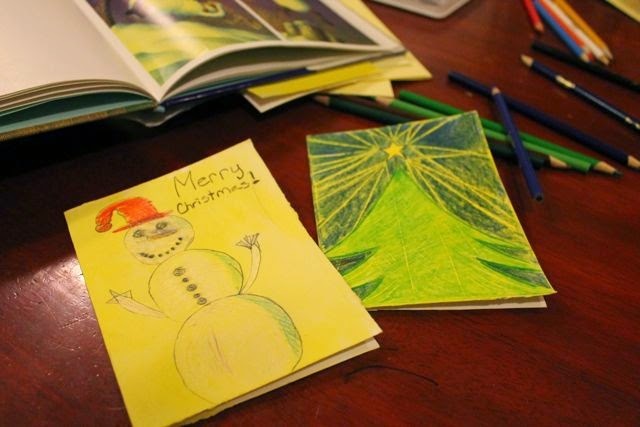 In this photo he sketches a Christmas tree with a regular pencil before scratching and using colored pencil. 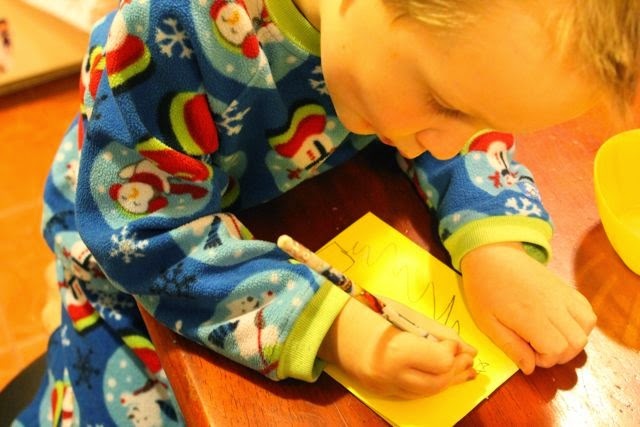 After he finished his Christmas tree card he wanted to make a snowman card just like his sister. 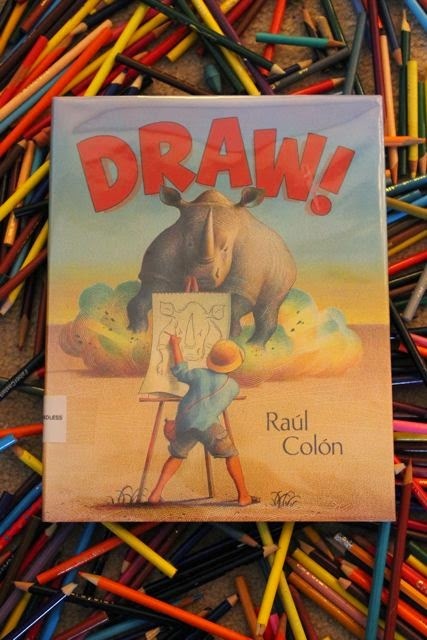 Raúl Colón's newest book is DRAW! It is a wordless book about a boy's imagination transporting him to Africa to sketch animals with colored pencils. The adventure is full of close encounters, sandwiches, and a new friendship with an elephant! Reading DRAW! with my children inspired us to DRAW more cards.